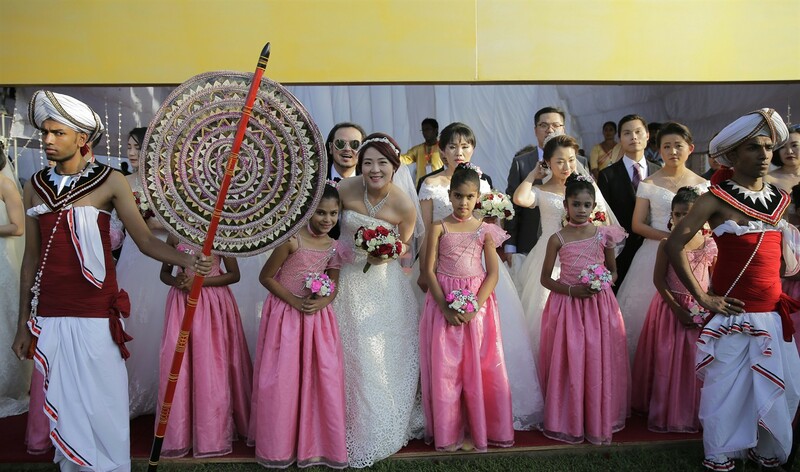 Colombo, Dec 18: A grand mass wedding ceremony for 50 Chinese couples took place in the Sri Lankan capital on Sunday as part of the the government's agenda to promote Sri Lanka as an ideal wedding destination. The ceremony which was held in the Colombo Municipal Council grounds was attended by Megapolis and Western Development Minister Champika Ranawaka, Tourism Minister John Amaratunga, Health Minister Rajitha Senaratne, Petroleum Minister Arjuna Ranatunga and China's Ambassador to Sri Lanka Yi Xianliang, Xinhua reported. The event was organised by the Ministry of Megapolis and Western Development, the Ministry of Tourism and the Chinese Embassy in Sri Lanka. Ranawaka, speaking at the ceremony, thanked the couples for choosing Sri Lanka as their wedding destination and said both nations have shared strong and historical ties since ancient times. "Sri Lanka is very proud to be selected as the destination for these couples to celebrate the most important days of their lives," he said. Ranawaka added that while this event would also promote Sri Lanka's beauty globally, the country itself is undergoing further development with the construction of new hotels and other areas catering especially for tourists. Amaratunga told Xinhua that this event would help boost Sri Lanka's tourism. "We hope through this event, many other couples, from other parts of the world, will select Sri Lanka as their wedding destination," he said. The brides and grooms were dressed in typical Sri Lankan wedding attire, traditional Chinese wedding outfits and gowns and tuxedos. After the traditional dances, the couples were accompanied into heavily-decorated tents where each couple exchanged rings while a holy thread was also tied on their fingers amidst religious chanting. Wang Yan, a bride who participated in the mass wedding, said that she had learnt of the event through her friends and she was happy to select Sri Lanka as her wedding destination. "The people here are very friendly and we have been treated so well. Sri Lanka is a beautiful country," she said. The couples, on Monday, will be taken on a tour of Yala, Sigiriya and Kandy, which are all popular tourist spots in Sri Lanka. Sri Lanka has become a popular destination for Chinese tourists with China currently being the second largest market.